You know Dyson. It's the company that makes futuristic looking household appliances, such as vacuum cleaners, fans, and even hair dryers. It also jumped into the air purifying and humidifying market. The Dyson AM10 Humidifier maintains that familiar Dyson design, so it's unmistakable. Compared to other humidifiers available, this is probably one of the most attractive. The polished chrome look, along with it's oval shape is pleasing to the eye, and it'll work especially well with minimalist furniture and décor. Is that the most important aspect to a humidifier, though? Certainly not. What it's really about is how well it works, how easy it is to use, the maintenance involved, and the value, regardless of cost. Let's explore the Dyson Humidifier Review and see what others have to say about its features, the pros, and the cons. The obvious expectation of any Dyson product is its appearance. If you’re buying Dyson for any particular reason, it’s either for its looks or its performance, or both. The shape is similar to Dyson’s other products, such as its fans and hair dryers. The oval loop, which is the “air multiplier,” (we’ll get to that soon) is the most prominent visual feature on this humidifier. The water tank sits below that and it’s translucent, so you can see precisely when it needs a refill, though there are other indicators. Below that is the base, which is where all the magic happens. The Dyson AM10 Humidifier is equipped with a thermostat and humidistat, which measures the temperature and humidity of the room. There’s also a bright blue light that lets you know when the machine is plugged in and turned on. You get a remote control with this unit, which is magnetic, so you can keep it on top of your humidifier, which helps you keep track of it. While that’s a helpful detail, there is a bit of an issue with the remote control. It’s the only way you can control your humidifier. Lose it, and you lose all ways to manage the humidity in your home. There are no controls on the humidifier itself. The lack of controls on the base certainly adds to the sleek look of this humidifier, but it loses points in functionality. When it comes to efficacy, the Dyson AM10 Humidifier is golden. It tops many other ultrasonic cool mist humidifiers in various tests. It can effectively raise the humidity in a room by 24 percent. The great thing about an ultrasonic humidifier is that it is essentially silent. The technology uses high-frequency sound to create vibrations, which tosses water around, creating a mist, which is then emitted by the machine. 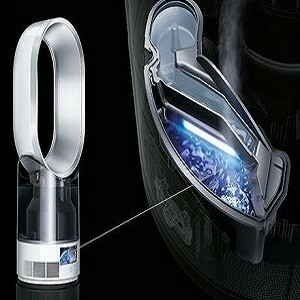 For some reason, and perhaps it’s to offer dual-functionality, Dyson included a fan with this humidifier. The included fan has variable speeds, so you can keep it low (at 1) or crank it up high (at 10). It’ll help keep your room cool, and Dyson claims that it will help evenly spread humidity throughout the room. However, many testers have proven that the fan makes no difference in the humidity of a room. It does make a difference in noise, though. At its lowest setting, the fan isn’t all that noticeable, but at its highest setting, it reaches more than 50 decibels, which is the equivalent of conversation in a home. That may not seem terribly loud, but if you’re buying this humidifier because it’s supposed to be quiet and you’re sensitive to sound, you may not be pleased. Setting the fan feature aside, let’s look at the water tank. You don’t need a view window to see the water level, as this tank is totally see-through, which is a nice feature. You’ll also see a visual indicator on the glowing display to let you know it’s time to refill. To take care of this common chore with any humidifier, you have to remove that “air multiplier” loop from the Dyson unit. Then you can access the water tank, which is mostly enclosed. There’s a plug that you have to unscrew, and then you can finally fill the tank up – but the opening is surprisingly tiny. Make sure your aim is good when filling this .75-gallon tank up in the sink, otherwise you’ll get water all over. Even if the small opening doesn’t bother you when refilling the tank, you might take issue with it when it comes time to clean the Dyson humidifier. Like all humidifiers, the Dyson unit needs a weekly or monthly cleaning, despite its ability to kill 99.9 percent of germs and bacteria, like E. coli. The way the Dyson manages to keep things mostly clean is by use of a UV light that’s meant to sterilize the water and everything in that tank. If that helps you sleep better at night, then this could be a good feature for you. Regardless, you still need to wipe everything down and soak the tank and other pieces in a vinegar or citric acid solution, according to the instructions. If you have hard water, you’re likely to notice hard-water deposits. Good luck reaching them to scrub them off – you have no access to the inside of that water tank. The bright blue light on the side of this Dyson humidifier could be seen as a feature or a bug, but that’s all subjective. If you like having a glow in your bedroom to use as a nightlight, the light is bright enough to illuminate just enough for you to see a little. On the flip side, blue light is one of the worst colors of light to have in your bedroom when you’re trying to sleep – studies have found that blue light increases alertness and can reduce your production of melatonin, which is what you need to feel sleepy. If you’re particularly sensitive to light, then this is going to be a problem for you. Of course, you could just slap a piece of tape over it. And then there’s the cost to consider, which doesn’t make up the full value of this product, but it’s a big part of it. The cost of this humidifier is easily four to five times more expensive than some of the other high-rated humidifiers on the market. If cost is a big factor for you, then this Dyson humidifier may not have nearly as much value to you. If you skipped the review above, then here are the features broken down in easy-to-digest snippets, including the benefits of each one. Also included are the caveats you might need to consider. 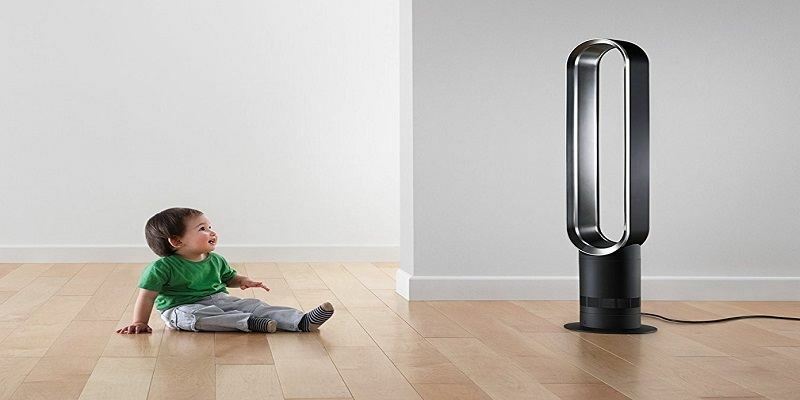 The Dyson AM10 Humidifier is a multifunctional unit thanks to the included fan. So, on those hot summer days and nights, you can turn on the optional fan to get a cool breeze. The settings vary from 1 to 10, with 10 being the highest. It’s a good feature, but it can be noisy, so it might not work for those who are sensitive to sound. The built-in humidistat and thermostat work together to show you precisely what the air is like in the room this Dyson is placed. You can set the humidifier to run until it hits a target humidity level, and the unit will operate when it needs to in order to keep that level. That’s a feature of a great humidifier! Using the fan, humidistat, and thermostat, the Dyson AM10 Humidifier can automatically adjust levels of humidity and air to reach an optimal level of temperature and humidity for the room. You don’t even have to choose the level, just choose the automatic function. The only issue with this is that if you keep your humidifier in your bedroom, the auto function could kick the fan up to a 10 and that might be loud enough to disturb your sleep. When it comes to convenience, you can’t really beat having a remote control for a humidifier. From the remote, you can turn the unit on or off, turn the humidity function on or off, set the humidity level lower or higher (20 to 70 percent), adjust the fan speed (1-10), set the timer (15 minutes to 9 hours), or choose the auto function. The remote is magnetic and will stick to the top of the Dyson humidifier. One caveat: There are no controls on the unit, so don’t lose the remote! You can be sure that as long as you don’t have a defective unit, the Dyson AM10 Humidifier is going to perform as well as or better than any other room humidifier you’ve tried. It has gone through several independent tests and has proven time and again that it effectively raises the humidity in a room by several percentage points – up to 24 percent more humidity in one tank. Dyson has included a UV light to sterilize the water you pour into the tank. This means you can use tap water with no qualms. However, hard water may still create a residue inside. The UV light is meant to kill up to 99.9 percent of bacteria, which could be a huge plus for you. However, it’s still going to need regular cleanings (more on that below). At just a little more than 3/4 of a gallon, the tank capacity is generous, but not huge. So, you should be able to easily lug this from the sink to the Dyson unit. It’s also translucent, so you don’t have to guess on when the tank needs a refill. This will need frequent refills, though, if you need a lot of humidity – at least once per day. Dyson knows design. There’s no denying that this humidifier is one of the best-looking options out there – it doesn’t look like it belongs on a bedside table in a hospital. It’s convenient to have a display that tells you everything you need to know about your humidifier, whether that’s the temperature, humidity level, or water level. However, the bright blue light may be a no-go for you if you’re sensitive to light, especially at night (if you keep this in your bedroom). All humidifiers need maintenance, from refills to cleaning. The Dyson AM10 Humidifier is more difficult to maintain than most others because of some flawed design details. The opening in the tank for water refills is so tiny that it could be frustrating to deal with every day. Cleaning the tank is also a pain. All humidifiers should be soaked in a vinegar or citric acid solution, but most of them have openings wide enough to fit your hand in, so you can scrub away at hard-water residue and other buildup. Not the Dyson humidifier – you’ll have to rely on the soak. It helps to see how others reviewed a product after buying and using it. You get a better idea of the perceived value, the maintenance, the ease of use, and much more. Generally speaking, the Dyson AM10 Humidifier is easy to use for most users. The remote control is self-explanatory, and the instructions included are clear enough to help you through any errors, cleaning, assembly, and maintenance. When it comes to producing a fair amount of humidity, the Dyson gets high marks from most consumers. Unless a person received a defective unit, the overall opinion of this humidifier’s performance was quite high. It’s safe to say that most people who bought this Dyson humidifier did not feel it was a good value. The expensive cost did not seem to justify the purchase for most users. Many people saw the Dyson AM10 Humidifier tank as small, unwieldy, and hard to fill. With that said, most customers liked the clear tank. The run-time of this Dyson humidifier probably had the most hit or miss reviews out there. Some people reported only three hours of humidity on one tank, while others were averaging 10 to 12 hours. There were other reports of all hours in between, so experience may vary. It’s logical to assume when you buy a product that claims to have a UV light to kill off 99.9 percent of bacteria that you won’t have to clean it as often as other humidifiers. However, reviewers expressed frustration that they were expected to give this Dyson humidifier a cleaning every week – just like any other ultrasonic humidifier. For the most part, consumers who bought the Dyson AM10 Humidifier liked the remote control, its storage capability on the unit, and its functionality. However, many people also discovered that the unit cannot be controlled without the remote – and a replacement remote control is about $30. While most people agreed that this Dyson humidifier is an excellent addition to any bedroom, as it can add humidity to the air while you sleep, but people were also quick to point out noise and light disturbances. The unit can sometimes make watery dripping and gurgling noises, along with a slightly loud fan noise, and the light on the unit is bright enough to keep some people awake. As mentioned above, the Dyson AM10 Humidifier can make some noise while in operation. It’s not terribly loud, but it isn’t whisper-quiet either. Those who were not sensitive to sound had no issue with the water dripping or gurgling noises, or the fan blowing even at high speed. Equally, those who need silence to sleep were annoyed with the noises. When Dyson makes a new product, tech magazines, conventions, trade shows, and appliance aficionados stand up and take notice. 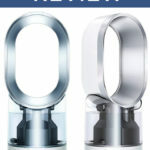 The company created the Dyson AM10 Humidifier to fit in with its design-forward line of products. The sleek look works well in any décor, but especially minimalist homes. It looks as expensive as it is. And it is quite pricey for what you’re getting. Make no mistake, this humidifier works well. It will effectively raise the humidity in your home, and its humidistat is as accurate as they come. This Dyson humidifier comes with a few design flaws, though, that could make or break your decision. While it does make some noise, it isn’t too loud. And although there are no controls on the unit, making the remote control a necessity, the remote is easy to use and it attaches to the unit itself for easy storage. The UV light should kill off 99.9 percent of bacteria in the water tank, but you’re still going to need to give it weekly cleanings. If you’re ready to fork over the cash needed to score one of these futuristic, sleek looking humidifiers that work well, but still have some kinks, then you could be very happy with your Dyson AM10 Humidifier.